Six years ago, Andrew and Gabriella Morrison and their two kids lived in a 2,200-square-foot house in Ashland, Oregon. Andrew describes it as the perfect house on the perfect street in the perfect town — the American dream, really. On the outside, the family appeared to have everything. But on the inside, they were feeling increasingly stressed by their finances. “We started recognizing the financial and energetic cost of living there and how busy we were trying to maintain it,” Andrew says. So, the family of four decided to downsize — in a major way. The Morrisons’ decision to ditch their seemingly picture-perfect suburbia lifestyle happened fast. Andrew describes it as an “aha” moment. In the midst of their frenzied days, Gabriella received an email from someone whose signature line read, “Tiny House Blog.” She’d never even heard of tiny houses before. So naturally, she did a quick internet search. Within 30 minutes of researching the tiny-house lifestyle, Gabriella says everything became clear about why they were having issues and what needed to be done. Gabriella learned the average U.S. household holds something like 300,000 items — everything from paperclips to armoires. That’s a lot. So the family created something they called a “365-day rule.” Each time someone went into a room with a drawer or cabinet, every single item was pulled out. If the answer was yes, then they could decide if they wanted to keep it. If the answer was no, it went in an ever-growing pile in their two-car garage. After a couple of months, that pile of cast-off items grew about two feet high. Once an item was in the pile, they decided if they still wanted to keep it, or if they wanted to sell or donate it. “The more we did it, the easier it became and the more excited we got,” Gabriella says. When the pile dwindled to heirlooms and childhood tokens, the family took a breather. They put them in a small storage box to return to a few years later. Their inevitable solution for many of those items? Take photos of them or digitize them. For example, they’d transfer old photos to CDs and take photos of old trophies. In the end, the family rid themselves of about 80% of their belongings. Although it was their perfect home, the family was excited for their newest adventure: pop-up living on the shores of Mexico. After purging material goods, the family decided to test out the tiny lifestyle by living in a pop-up camper for nearly five months on the beaches of Baja, Mexico. The couple continued to operate their business, Straw Bale, which focuses on homes made of straw bales. Their son, Paiute, was off at boarding school, so there was one less body in the newly adopted living space. However, it wasn’t all frolicking in the Sea of Cortez (though that did happen a lot). Gabriella remembers being “shocked and disturbed” during that first month in the camper. The emotional withdrawals from the lack of electronics and material goods were surprisingly intense for Andrew and Gabriella — even for their home-schooled daughter, Terra, who was 11 at the time. At one point, the trio was so uncomfortable, they almost packed up and returned home. Gabriella and her daughter soon followed. Today, the Morrisons consider it the best experience they’ve ever had. 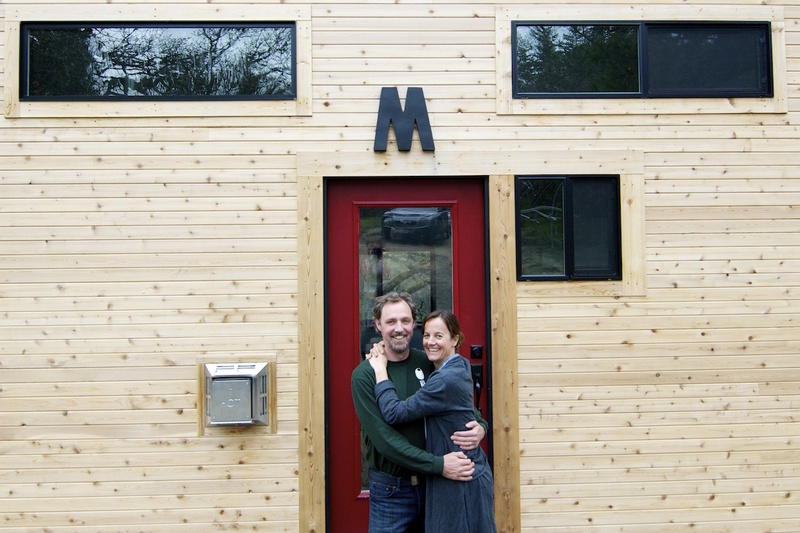 After five months, the Morrisons returned to Ashland to scout out the perfect piece of land for a permanent tiny house. Although the ZIP code was expensive, the family resolved to stay where they’d already established a life. But the couple wasn’t willing to go into debt. So they waited. During that time, which ultimately lasted two years, they rented the smallest house they could find. Even then, the space wasn’t small enough. Andrew and Gabriella settled into the walk-in closet — about the size of a queen mattress. Finally, Andrew and Gabriella found what they were looking for: five acres in the Rogue Valley, amongst the mountains. There was even a creek cutting through the property. Although it posed some problems, like a lack of approval for a septic system and challenging access to the building site, Andrew was a former builder with ample experience, and he accepted the challenge. Andrew and Gabriella moved back into their pop-up camper to start building their tiny dream home on their newly-acquired land. Rather than commuting from town each day — about a 30-minute haul — they figured they could be more efficient living right on the job site. The two returned to town to stay with a friend and resumed construction while Paiute and Terra were off at boarding school. It took about four months for Andrew to complete the 207-square-foot tiny home — plus 110 square feet for a sleeping loft. It’s been three years since the Morrisons completed their tiny masterpiece. Now they live in the space full time. And it’s not just the two of them, as Andrew and Gabriella initially planned. Paiute has since returned from boarding school. He’s 20 and plays for a competitive hockey league. Terra, now 17, has also returned from boarding school and is finishing high school in Ashland. It’s a full house. But they don’t wish for a larger space. They just want a permanent dining room table — one they don’t have to flip down each time they want to use it, one they can all gather around. How Much Money Can You Save Living in a Tiny House? Gabriella says the benefits of living tiny far outweigh any downsides. The biggest perk? They’re no longer financially stressed. Gabriella estimates that in about two more years they’ll have paid off their tiny home with the money they’ve saved by not having a mortgage. Utilities have been slashed, too. Heating a 207-square-foot home is a lot less expensive than a 2,200-square-foot home. They’re also technically off the grid, so their solar power is free and the water runs from a well. Their monthly bills have been shaved down to internet, phone and garbage. They pay their propane heating bill twice a year. They’ve also noticed a difference in their grocery bill. By American standards, their refrigerator is about half the size of a “normal” one. But because they don’t have any of those deep, dark corners, items can’t be tucked away and forgotten; every food item is in view and consumed. Andrew and Gabriella have also become more aware of their spending habits. Neither was ever a shopaholic, but impulse buying definitely happened. Now, they just don’t have room for it. They’ve even stopped taking freebies. Andrew shares a story about how he opted out of the “free” counterpart of a BOGO deal for pants. He had to explain to the cashier that he lived in a tiny home; he didn’t have room for another pair of pants. The couple laughs. “It’s taken our mindset to where, even if it’s free, if you don’t need it, cut it,” Andrew says. Gabriella suspects they’ve cut at least $300 from their spending each month — just by living in the smaller space. That’s $3,600 a year — at least, Gabriella emphasizes. “We had a choice what to do with our money, and, had we not gone through the experience of living minimally, I have no doubt that we would have just put that money into a much bigger home,” Gabriella says. Instead of paying off debt, the power couple built a business from their passion: Tiny House Build. Because they live and breathe the lifestyle, they offer resources and host workshops for those who hope to build tiny homes of their own. Your Turn: Would you be able to survive in a tiny home with your family?